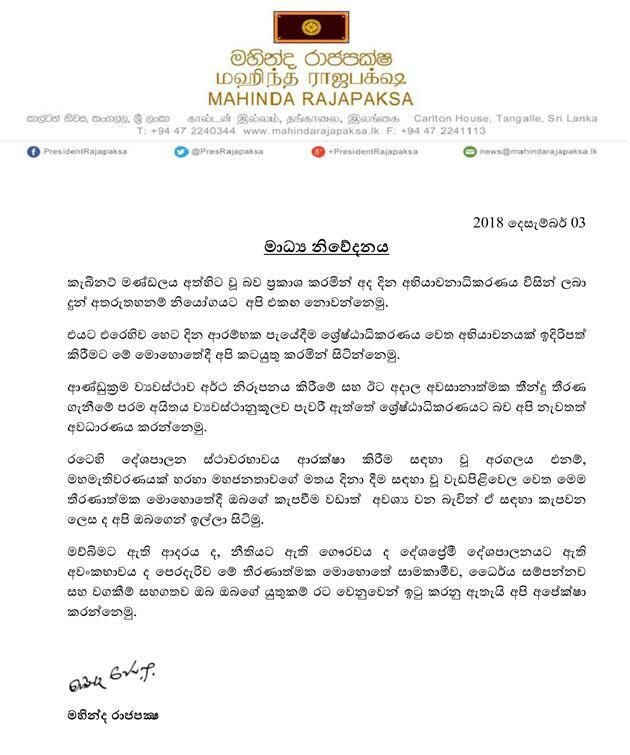 He doesn’t agree with the interim order given by the Court of Appeal yesterday (3rd) preventing Mahinda Rajapaksa and his cabinet from functioning as prime minister and ministers says Mr Mahinda Rajapaksa. The Court of appeal issued the interim order yesterday restraining the functions of Mr Mahinda Rajapaksa as the prime minister and members of his so-called cabinet as ministers. In a letter issued with Mr Mahinda Rajapaksa’s signature, it is stated that they do not accept the decision of the Court of appeal and they would file an appeal against the decision in Supreme Court today (4th).